Curved hook specifically designed for Gammarus Patterns and is listed in their Nordic Salt collection.....but don't let that fool you. This hook has tons of uses! The Ahrex NS172 is curved hook specifically designed for Gammarus Patterns and is listed in their Nordic Salt collection.....but don't let that fool you. This hook has tons of uses! Probably the biggest use has been on streamers. Articulated tyers are loving this for the back hook but it also makes a great choice for the main hook as well. Both large and small flies. In the smaller sizes, this has also become a "go to" carp hook. Just the right shape. The lightweight wire allows the flies tied on this hook to be fished in shallow waters. If you want to add weight, it is easily done without ruining the hooking capabilities, due to a large hook gape. 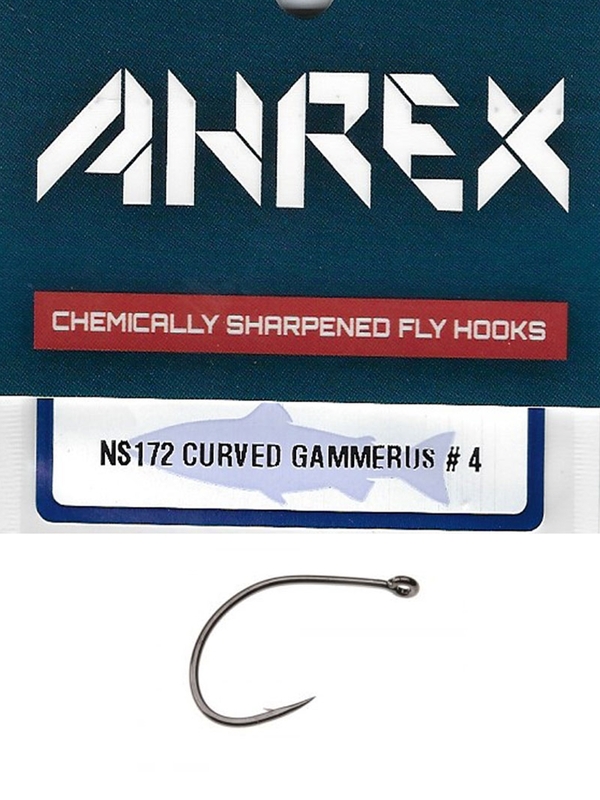 Ahrex NS172 Nordic Salt Curved Gammerus hooks come 18 to a package.